Munin the raven, faithful messenger to Odin, now stands stripped of wings and transformed by Loki into a mortal girl. Flightless and determined, she will stride through the nine worlds of Yggdrasil to reclaim the lost feathers and return to Asgard. 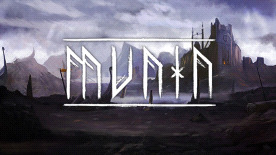 Munin bolsters the traditional side-scrolling experience with the use of rotating environments to surpass obstacles and to solve puzzles. By twisting portions of the environment, players will create bridges from pillars, turn walls into floors or open new passages. Further gameplay elements, like switches, moving environment or items influence by physics add even more depth to the puzzles: by rotating the game's world, boulders and debris will rumble, roll and fall. Liquids like water or lava will flow accordingly and Norse runes will show the way to the raven's lost feathers. Munin features nine amazing worlds, 81 exciting levels and roughly 7 hours of enjoyable playtime. 81 challenging levels featuring extraordinary worlds. © Copyright 2014 Daedalic Entertainment GmbH and GOJIRA LDA. Daedalic and the Daedalic-Logo are trademarks of Daedalic Entertainment GmbH. All rights reserved.